We cover lots of fashion (obviously! ), money management, store features, and everything else you need to get ready for market season and all the brides you want to meet during the upcoming Engagement Season! It’s our biggest and best issue yet! Send Your Message - Social media tips, marketing ideas, and all other kinds of information about building a brand story and reaching your ideal brides. Having a clear story to tell your brides is what sets you apart from other bridal businesses and helps them fall in love with you and your dresses before they even make it through the door. Want to stay on top of all the business building brilliance our contributors bring together every quarter? 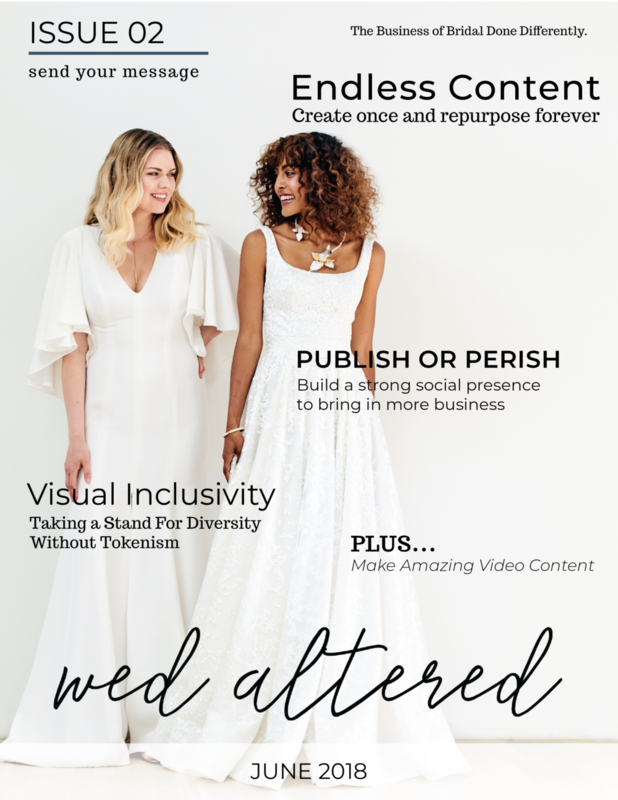 Grab a 100% free subscription and get a digital copy of the newest Wed Altered magazine sent straight to your inbox as soon as it's published! You'll also get regular blog posts, industry news, and information about the bridal community and projects we have in the works. Information on advertising in the magazine or in the directory. Submit an expert article for the magazine or our weekly blog posts. Sign up for the Designers Only Newsletter to get our trend report calls and other upcoming features info (plus business building info just for independent bridal designers).